We are super excited to introduce the first ever crypto exchange in our Trading Panel. 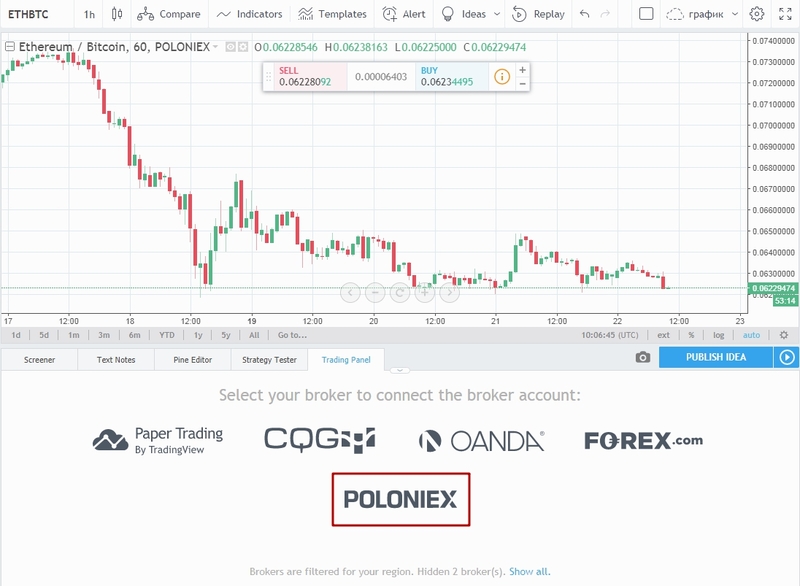 You can now trade directly from your TradingView charts if you have a live account with Poloniex. Here are the steps to start trading. Log into TradingView by entering your login and password on the main page – www.tradingview.com. Open the chart & select the Trading Panel at the bottom of your screen. Select Poloniex and enter your Poloniex account credentials to log in. Note that you need to get the API Keys on Poloniex that will be used to log in. 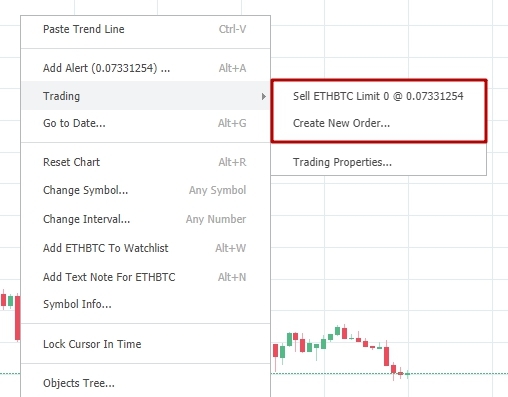 Once you’ve logged in, you should be able to see 4 tabs: Orders, Balances, Trade History and Notifications log. We’ve made it possible to sort and view orders according to their status in the Orders tab. This has been done for the sake of convenience. The grey line is always visible and displays the balance for the main cryptocurrencies. 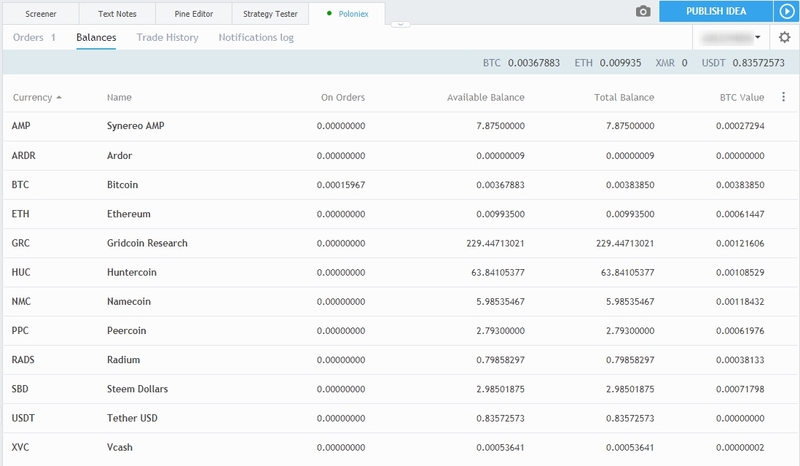 You can see all cryptocurrencies that you have in your trading account in the Balances tab. The amount is displayed in a respective cryptocurrency and in BTC. You can see the history of all trades and notifications in the Trade History and Notifications log tabs. Note that the notification history is stored during your session only. Trading properties can be adjusted in the menu that is located in the top right corner of the Trading Panel. The last 2 options allow you to disconnect and select another broker. Your account ID along with a dropdown menu that enables switching between the accounts (if you have an ID with multiple accounts) is located in the same place. Your account currency is displayed in that menu as well. You are able to place your order in several ways. The context menu on the chart or in the Trading Panel, the + sign on the chart as well as the floating Buy/Sell panel. You can set the price in the order window. 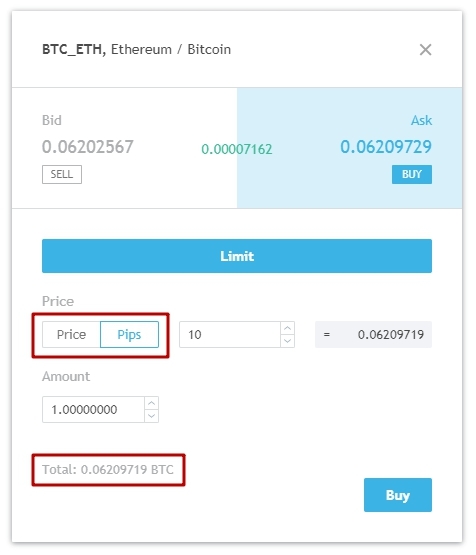 We’ve made it possible to switch between the price and pips for your convenience. The total amount is also displayed in BTC. 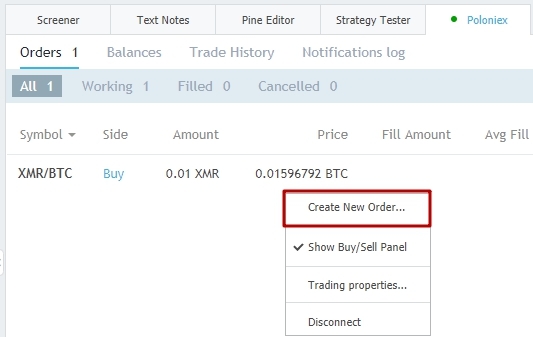 Important: Order execution happens on the exchange side. We are merely displaying the information that we receive from the exchange. Crypto exchanges can be supported in our Trading Panel once they integrate with us through the REST API. Feel free to contact us if you wish to learn more about the integration. We wish you a lots of success in your trading! Thanks for choosing TradingView and we hope that you’ll enjoy trading cryptocurrencies on our platform. As always, your feedback is highly appreciated. Let us know if you have any suggestions for improvement.